The German sculptor Karl Manfred Rennertz from Baden-Baden came to Borås with chain-saw and axe to make an exhibition out of Swedish wood, fallen in the January storm. In place he powerfully and fast finishes his sculptures. The marks from the chain-saw and the sharp cuts from the axe he leaves to be visible. He wants to us to see the working process and the raw character of the material as it’s an important part of his expression. The sculptures are painted with colour but to get the black in his figures, heads or reliefs he uses fire. With a gas flame the pigments are burned into the fresh wood. On the night of the opening Karl Manfred showed a fire sculpture in the water outside the gallery. 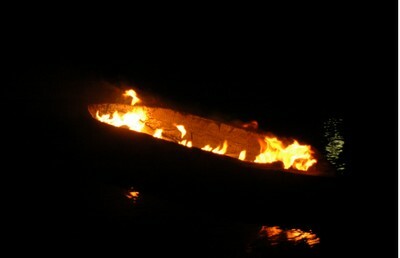 Fire is caught in a wooden container, resembling a boat, made by the artist. In this performance fire and water – two powerful elements – collaborate.Skulpturerna är gjorda med tanke på det gamla stenhuset som nu är galleri. Rennertz b.1952 is well known for his expressive sculptures and in the 80’s he belonged to the group “Neuen Wilden” or Neo Expressiven, whom at that time redescovered the figurative art. He’s a professor in sculpture at the university in Detmold and as a sculptore internationelly known, The serie of exhibitions, “Moving Woods” has in recent years been showed in many museums in Germany, France, Lithuania and Latvia.